A new quarterly report, released today, aims to paint the broadest picture yet of UK health and wellbeing. The Simplyhealth/YouGov Everyday Health Tracker will survey 2,000 people and ask them 26 questions about health, ranging from diet and exercise habits to concerns about future health. A subset of the data is being used to create the Everyday Health Index – the first regular measure of the nation’s health. The Tracker is intended to provide a regular reference point for stakeholders across the healthcare industry, as demographic change and new treatments and technologies take us into a new era of healthcare provision. • Obesity: Middle-aged storing up health problems. The Tracker’s BMI data shows that a third of women and a fifth of men are obese. Obesity is highest among people aged 40-54; but asked to rate their own health, those aged 45+ underestimate their potential health problems the most. • NHS guidelines on diet and exercise not having enough effect. While 87% of people know they should eat ‘5 a day’, just 29% do so. Only 17% of people take the recommended level of aerobic exercise and 12% the recommended amount of muscle strengthening exercise. 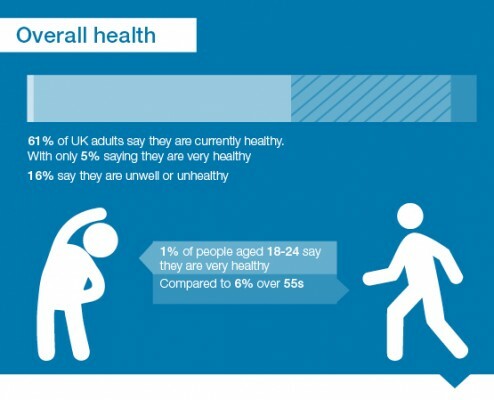 • 14% of people say they have little or no responsibility for their own health and wellbeing. 28% of people think food and beverages companies are responsible, a higher figure than for government and employers. • Everyday health conditions as worrying as ‘Big Three’. The prospect of having debilitating health conditions like arthritis, joint pain and back pain worries people just as much as stroke, cancer and heart disease. • Women more concerned about all health problems. 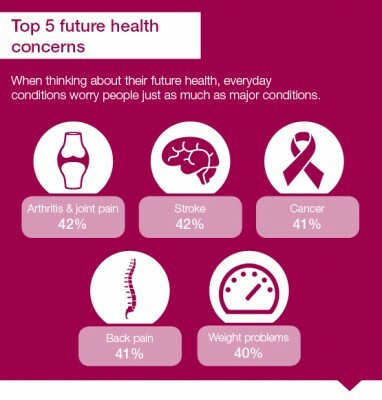 Weight, arthritis/joint pain and stress/anxiety top their list of future health worries. But weight concerns do not translate into action, with a third of women taking less than one 30 minute exercise session a month compared to a quarter of men. • Fitness technology: low takeup but huge potential to improve health. Just 5% of people used fitness apps regularly in the last 3 months and only 4% a fitness tracker. But walking outdoors and exercising at home are the two most popular forms of exercise, for which apps and trackers are ideal motivational aids. • Index shows regional differences: London and the South are the healthiest regions, Wales the least healthy according to the Index. Women are slightly healthier than men. We’ve launched this Tracker with YouGov to help inform the debate on the future of UK healthcare. Changing demographics, increasing obesity and new technologies and treatments are demanding a new approach to healthcare delivery. To make the best decisions, our healthcare sector needs the best information. “The Tracker shows that when thinking about their future health, people worry just as much about everyday conditions like joint and back pain as life-threatening illnesses. As our population ages, we need to have an honest discussion about how – or if – the NHS can meet the increasing demand for everyday health treatments. • A nation of carers. A third of people have cared for others (not including children) in the past three months. Half these people say it had a negative impact on their health and wellbeing. • ‘Silver drinkers’ are a real phenomenon: Men and women over 55 are most likely to consume alcohol every day, with 13% of men and 8% of women in this age group drinking daily. 17% of men this age drink over 21 units a week (21 units is maximum recommended) and 13% of women consume 16 or more units a week (14 is maximum recommended). Topics covered in the Everyday Health Tracker include smoking, drinking and eating habits, the types of health practitioner people visit and the health and wellbeing products they buy. The full report is available to purchase from YouGov at ReportsSales@yougov.com. 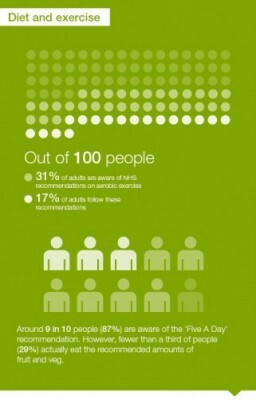 A summary of findings is available at http://reports.yougov.com/services/everyday-health-tracker/. Simplyhealth supports people with their everyday health through health cash plans, dental plans and mobility products and daily living aids. Its roots are in the hospital funds set up in the Victorian era to help working people save for their medical care. With no shareholders it exists solely to serving its customers and supporting charitable causes. To find out more visit www.simplyhealth.co.uk.